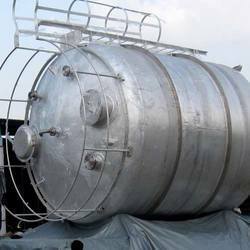 We are manufacturer & service provider of aluminium storage tank, storage tanks. We also offer aluminium fabrication services, blender blades, heat exchangers, industrial conveyors & pressure vessel. Our range of Aluminium Storage Tank is well known for its international quality, durability, corrosion and chemical resistance. Fabricated from superior quality raw materials, these storage tanks are extensively used in storing chemicals. Made in our latest technology equipped production unit by team of dedicated technicians, these tanks are available in the capacity of 30,000 liters. Several quality tests are done to ensure world standard quality of these tanks. We are one of the major Manufacturer of Aluminium Tank for Nitric Acid Storage. We can manufacture as per requirement of (various Capacity from 0.5kl to 200kl capacity) With an Aluminium Purity 99.96%. Our range of Aluminium Storage Tank is well known for its international quality, durability, corrosion and chemical resistance. Fabricated from superior quality raw materials, these storage tanks are extensively used in storing chemicals. Made in our latest technology equipped production unit by team of dedicated technicians, these tanks are available in the capacity of 80,000 liters. Several quality tests are done to ensure world standard quality of these tanks.